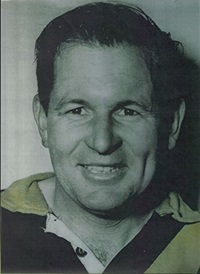 Fred ‘Mulga’ Davies was a Carlton champion and vice captain when he made the decision to transfer to Tasmania to become a coach in late 1952. A powerful forward and ruckman, Davies was able to have a tremendous influence over a game. His leadership qualities were without peer both on and off the field. He transformed the Northern Midlands town of Longford in the 1950s to become a force in Tasmanian senior football. The Tigers reached heights that have not been emulated since, including three regional and one state premiership. Davies’ untimely death due to illness robbed the Tasmanian game of a great character and positive influence.